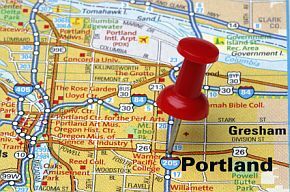 Oregon: Most of Oregon's 3.8 million residents live east of the Cascade Mountain Range near the border of the Pacific Ocean. They share the natural beauty of dense evergreen, mountain forests and coastal expanses of redwoods and Douglas firs with the many tourists. Windswept beaches, lakes and waterfalls are added to this mix, making the state a much revered natural attraction. Oregon is the nation's largest producer of softwood lumber and has had a thriving wood and paper products industry. In agriculture, it produces hazelnuts and cranberries and there is plentiful salmon in some of its river beds. The resulting housing slump from the recession continues to affect a slow but steady recovery. Unemployment fell from its highest level at 11.6 June 2009 to 8.9 December 2011. Top employers include the Providence Health & Services and the University of Oregon. Nike has its headquarters in the state and chip-maker Intel intends to open several more facilities. Levi-Strauss and U.S. Cellular are also major employers. For job seekers, the wood products industry, downsizing 6.8 percent 2011, is projected to grow 1.0 percent 2012. Other sectors expecting growth are metals and machinery; information; financial activities; education and health services; and leisure and hospitality. Additional information can be found regarding Oregon's economy and key employers by visiting Wikipedia: Oregon Economy.